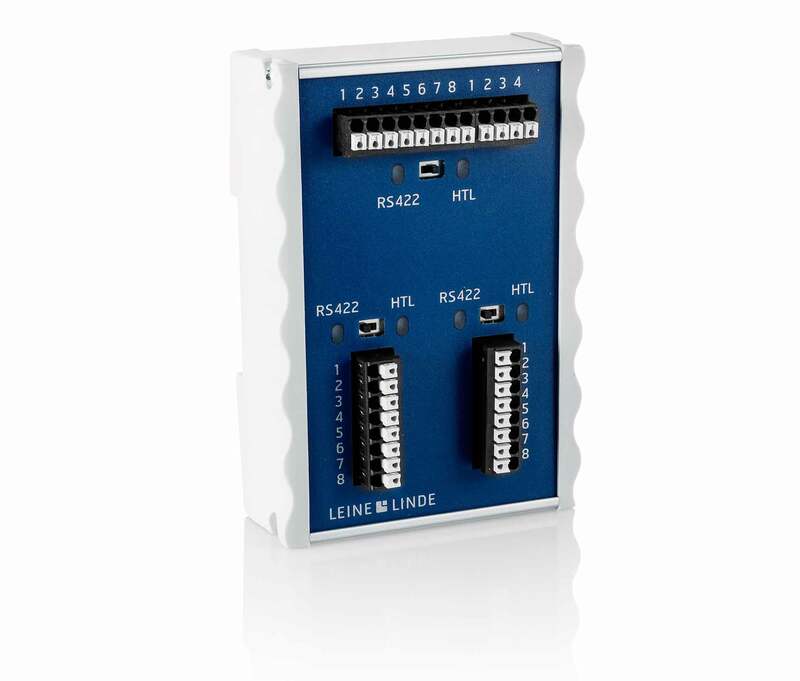 Schaumburg, IL (April 2015) – Leine and Linde now offers a newly revised signal splitter, allowing outputs from a single encoder to be sent to two separate control systems. This DIN Mounted Interface converter (DMI) provides this functionality as well as signal level conditioning to support both RS422 and HTL input or outputs. It can be used with either 7.5 or 15mm rails. The DMI is powered by a 9 to 30V dc supply which is then distributed to the encoder being monitored. 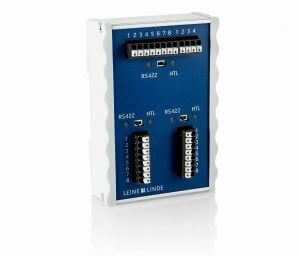 The encoder input channel accepts one HTL or RS422 level input signal and provides two HTL or RS422 output signals. Input and output levels are easily set by switches on the front panel and switch settings have illuminated indicators for verification. Galvanic isolation up to 1kV between the input and outputs prevents current loops and signal crosstalk from occurring. The DMI supports incremental encoders with A and B signals as well as the reference mark. Signals can be single-ended or differential. Each output of the DMI will connect to the following control electronics as a unique encoder would. Cable lengths can be as long as 1km for RS-422 and 200m for HTL signals up to 50 kHz. The DMI supports input/output frequencies up to 300 kHz with a maximum of 1µs propagation delay. For more information on this device, contact Bob Setbacken at HEIDENHAIN at 805-562-1160, or write to HEIDENHAIN Corporation, 333 E. State Parkway, Schaumburg, IL 60173.